If you're looking for a quality upright vacuum cleaner, the Shark Navigator Lift-Away Professional vacuum is one of the cheaper models on the market. At under $200, it's an affordable option yet comes with all the features you could ask for. The Shark brand has made a real name for itself in recent years in providing near-Dyson-quality vacuums at much lower prices. The lightweight design of this model makes the Shark Lift-Away easy to push around the house and even carry up the stairs, but looks elegant and stylish at the same time. All in all, it's a vacuum cleaner built with your convenience and comfort in mind. The fact that it's a best-selling product on Amazon should be an indication of just how much value it has to offer! Like any upright vacuum, the Shark Navigator Lift-Away slides across the floor as you push it by its handle. You’ll find that it’s much lighter than your average vacuum cleaner, so it’s far less effort to get your house clean. It may not be as light as a cordless cleaner, but the truth is that it has a much more powerful motor than your average battery-powered machine. You’ll love the way it feels in your hand, as the handle is designed for maximum ergonomic comfort and convenience. It is a bit top-heavy, meaning it tends to fall over fairly easily. It can also be challenging to release the extension arm, and it takes a bit of fiddling with the button to unclip it from its holster. With the Never Lose Suction technology built into the vacuum cleaner, you get maximum suction power with as little noise as possible. The Shark Navigator Lift-Away Professional vacuum is designed to get up ANY kind of dirt–dust, pet hairs, even items stuck in thick carpets. You’ll find that it does a great job on pretty much any surface, and you can get through large spots of floor with ease. The fact that the head is smaller (9.5 inches) than your average head (10 to 10.5 inches) means that it will take a bit longer to vacuum large spaces, but you can get into small spaces more easily. The wheels on the vacuum cleaner keep it rolling smoothly on hardwood floors and deep-shag carpets, and it’s very easy to steer. It requires very little effort to push it. 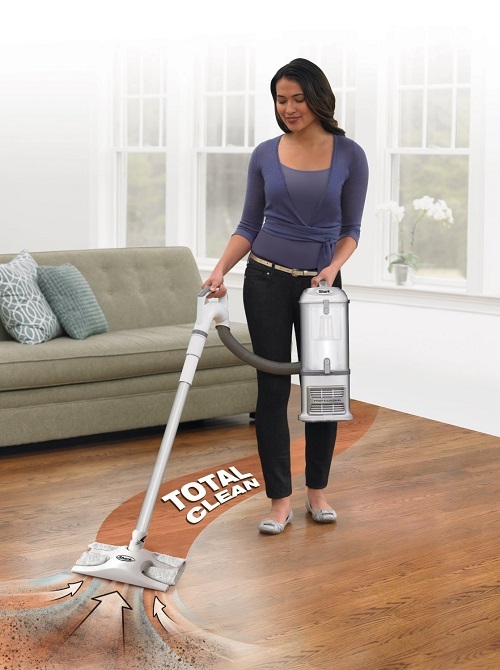 If you are going to clean hardwood floors, you’ll love this vacuum cleaner! It comes with a special hard floor attachment, along with two microfiber cloths that will protect your floors. It will get up all manner of dust and dirt from the floors, leaving your home nice and clean with ease. No scratches or marks on your beautiful wood using this lightweight vacuum cleaner! When you want to give your carpets a good cleaning, you can simply use the “floor brush” attachment. However, if you use the attachment, the vacuum cleaner won’t lie completely flat on the floor. This means that you will lose a bit of suction power, especially on deep shag carpets. The lightweight design of the Shark Navigator Lift Away makes it easy to lift it onto your rugs, and you can run over the rugs within a minute. It’s easy to vacuum rugs, and the weight will keep the rug pressed flat onto the floor while you vacuum. There are two crevice tools included with the vacuum cleaner: an 8-inch tool and a 24-inch tool. For taller users, you can attach the 24-inch tool and get into those crevices between couches, stairs, and even the ceiling. The hose isn’t quite long enough to clean the corners of the roof, but it’s great for getting into tight corners below eye level. 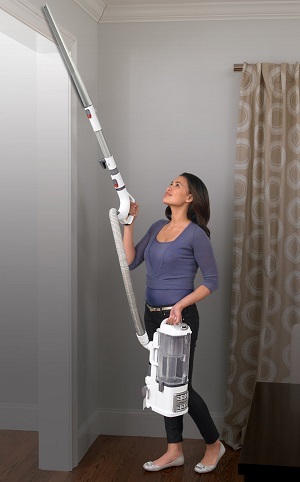 If you’re looking for a user-friendly vacuum cleaner, you’ll love the Shark Lift-Away Professional. Right out of the box, you can set up the machine in a few minutes. It is a machine that makes setup a breeze, and you can get to work immediately. While the machine rolls smoothly and easily on its wheels, you’ll find that it’s a bit unwieldy when you are trying to clean underneath tables. If you are using the roller brush attachment, the head is not flat on the floor, and this elevates the canister. You will either need to lie the vacuum cleaner flat on the floor, or else move it altogether. 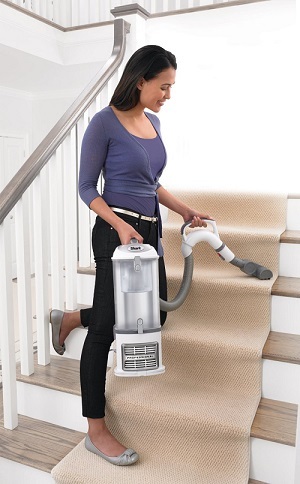 The fact that it’s so lightweight (for an upright cleaner) means that you can carry it up and down stairs with ease. The hose feels a bit short, meaning you have to bend over to get into the corners of the stairs. But with the 24-inch crevice tool, you can get the job done quickly without hurting your back. It’s far less noisy than your average upright vacuum cleaner, but it’s not the quietest machine around. The Shark Navigator vacuum has a powerful 1200-Watt motor, which gives it its suction power yet makes a bit of noise at the same time. You won’t be able to listen to music over the sound of the cleaner. Once the canister is filled with garbage, it’s a cinch to unclip it and empty it–perhaps a bit too easy! Some users have found that the bottom door of the canister opens when it is unclipped from the machine, emptying its contents on the floor. If you are going to empty it, make sure the bottom panel of the canister is securely clipped in place. Some users who have reviewed the Shark Navigator Lift-Away vacuum have commented on the fact that the hose tends to break very easily. In fact, when they have contacted the company for replacement, it seemed that this is a problem that the company is familiar with. Getting the replacement parts can be a bit of an issue, and the vacuum cleaner sometimes needs to be sent to South Carolina for repairs. That being said, the rest of the machine works well. The hose is essentially the only part that has a tendency to fail, but when it does, that can lead to suction problems. Thankfully, all of these issues are covered by the 5-year warranty, so it is possible to get the vacuum cleaner repaired. 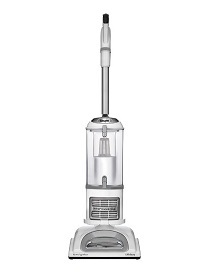 Compared to most of the vacuum cleaners on the market, this bad boy is a steal at $199. In performance tests, the Navigator Lift-Away vacuum cleaner didn’t quite stack up to the costlier models, but those models were about $400 to $500 more expensive. The differences in many cases were marginal, and the Shark Navigator only performed a bit lower than the competing models. For the price ($200), it’s a great vacuum cleaner to consider. If you are looking for a budget-friendly vacuum cleaner to use at home, it’s definitely worth considering this one. 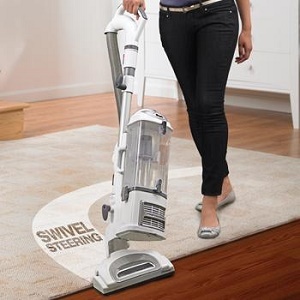 While the Shark Navigator Lift-Away Professional vacuum is not quite as versatile as a cordless vacuum cleaner, you’ll love how lightweight it is. It’s much more versatile than most upright vacuum cleaners, and it does a great job of leaving your home clean. The fact that it excels on hardwood floors makes your life much easier, and you’ll find that it does a great job even on carpets and rugs. Despite the few issues that it has, it’s a pretty great choice to consider.